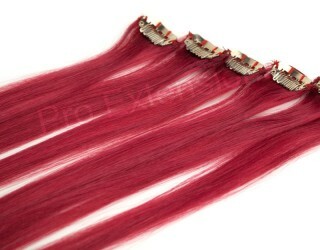 Spice up your look with Pro Extensions clip-in highlight streak packs. Available in an assortment of fun colors, these highlights are a fun and easy way to add color to your hair without the damaging effects of dye, or the hassle of colored chalk or aerosol sprays and paints. Our clip-in highlights snap on in seconds, giving you that fun pop of color that’s perfect for any occasion. Whether you are going on a girl’s night out, need an accessory for a costume or just want spice up your everyday look, our highlight streak packs are quick and convenient. These highlights can be curled or straightened just as you would your natural hair. 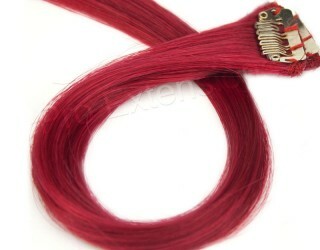 All of our clip-on highlights are made from Grade A+, 100 percent Remy human hair. Each piece measures 1.5 inches wide and 18 inches long. Our highlights are sold in packages of either two or six pieces.